New Orleans is a town full of mystery and legend with a plethora of stories waiting to be told on film. Dinner with the Alchemist (2016) attempts to tell one of these stories of murder and voodoo, and it hardly does an okayish job of it. The independent film, produced by CrisisLab, was directed by Kevin Good and stars Dan Istrate as the mysterious French-Romanian alchemist. Also starring in the film is Dionne Audain as voodoo mistress Marie Laveau, Megan Graves as the Mary the innocent prostitute, and Regen Wilson as Inspector McMurphy- the cop who loathes whores. When it is discovered that the feverish plague that has taken over New Orleans is not the only thing killing people in this town, it is up to cop duo Inspector McMurphy and Inspector Jenkins (Clayton Farris) to find out who is slicing the arteries of the town’s ladies of the night and draining their blood. It is the turn of the century in New Orleans. The film opens with young Mary walking down the night streets in the French Quarter. When new-to-town alchemist Jaques St. Germaine bumps into her, we discover that Mary is on her way to become a nun as her parents have just died from the fever that has inflicted the town. St. Germaine tells her to forget the nunnery and to find a job and then a husband. Mary, the bright girl that she is, finds a job in a local brothel as she hopes to find a fine young lad to wed there. 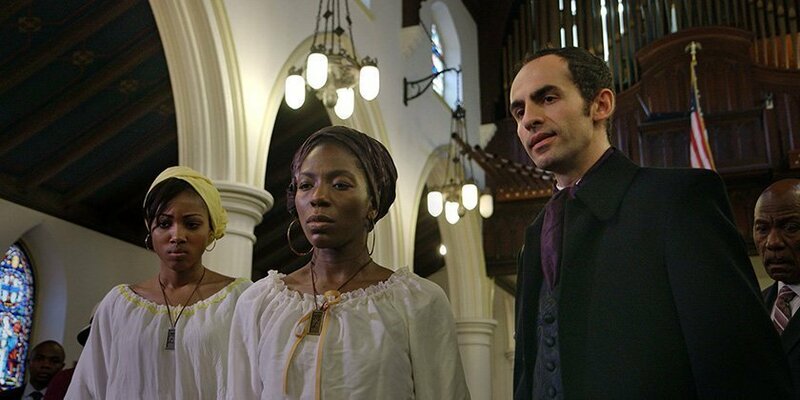 Next, we are introduced to Marie Laveau (Audain) and her niece Louise (Marly Chaudry) who run the local voodoo shop. St. Germaine initiates a friendship with Laveau and suggests that they can stop the plague together though there is no more mention of this after the scene. Audain and Chaudry are the only light in a film full of dismal acting. Though I hesitate to blame it on the actors as I believe the cast did the best they could with the script they were given. Half of the characters in the film seemed to have little to no purpose in propelling the plot and only existed for filler scenes. Others were given simple motivations such as Oliver Carter (Chris Stinson) a young sailor who was only created to strike a half-assed romantic plot line with Mary, the prostitute that refuses to lose her virginity. All in all, the script has the potential to be a chilling thriller based on the legends of New Orleans. However, the film has an excess amount of filler scenes, shock scenes that don’t fit with the tone of the film, way too many close-up alchemy sequences, and plot tangles. The scenes that were actually relevant to the plot relied too much on the sensation of being mysterious and not enough on creating legit reasons for the characters to do what they do. It is clear that screenwriter Jenna St. John attempted to write a script that connected a string of seemingly unconnected people with the mysterious murders of local prostitutes. However, what we ended up with was a jumbled mess where no character had a clear motive for the murders or a clear reason why they were in the film to begin with. The film focused hard on making the audience believe each character a plausible killer rather than on strong characterization and story. The characters were reactive to the plot’s events rather than active in pushing the plot forward. When it is finally revealed who the killer is, there is still no motive given until the last ten minutes of the feature, way beyond the point of the big reveal. While clearly the strategy was to keep the audience on their toes, instead they created a film that dragged on for ages. The language of the film was spotty. The term “whore” was said way too often and always with the same disdain, which put the town’s dislike for the profession too on the nose. Other themes were also too obvious. While this is a time-period movie, the audience was force-fed old fashioned views of virginity and worth. Mary’s character seemed to only exist as a sexual object for the alchemist, as a symbol for the purity of being a virgin and to push the ideal that a woman is only worthy as a bride. I really believe this film could have been good if the script had taken a few more hard edits before production. If they cut all of the filler scenes, tightened the plot line, and kept the close-up alchemy sequences (oh my god, there were so many) to only one powerful, mysterious scene. The film definitely had potential. As it is, I give it a 3.